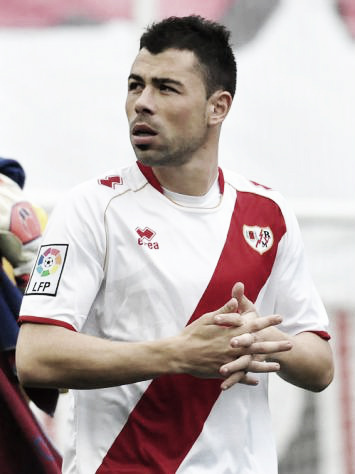 During those 3 seasons, between 2008-11, something was happening at Rayo Vallecano." When Chelsea took N'Golo Kanté, the cog that kept Leicester City together, there was a sense of déjà vu for me. It was a reminder of what had happened to my club. In 2010, Rayo did what they should have done a season earlier, and brought in a tough-tackling, all-action midfielder in Javi Fuego, and Rayo were promoted to La Liga after an eight year absence. He would go on to play two more seasons at the club, and became a fan favorite. And not just because of his dedication on the field. What makes modern football so beautiful is that some - few, but some - players love the game, or love a particular club, and stay for a reason other than the paycheck - like Javi Fuego rejecting a 800,000 euro move to Club Brugge in January 2012 because he loved playing at a club that couldn't even pay its players. But it was clear that Javi Fuego's ability deserved to be expressed at a bigger club. In late 2012, as his contract with Rayo descended into its final stages, everyone wanted him. And I do mean everyone. Míchel and Monchi at Sevilla said he was perfect for the club. Swansea sent negotiators to Rayo and even asked Michu for his opinion. Werder Bremen sent scouts to Rayo's game against Málaga. Hoffenheim stepped up interest after Boris Vukčević's car accident. Sampdoria wanted him because their scout, Igor Charalambopoulos, was part of De Biasi's technical team when De Biasi was Levante's manager in the 2007-08 season - Javi Fuego played for Levante that season. And even Club Brugge wanted him. Even Club Brugge! Despite the fact that he had publicly rejected a 800,000 euro move to Club Brugge in January 2012. And this time, the arrival of Spaniard Juan Carlos Garrido in November 2012 could be used as a sweetener. In the end, Valencia signed the player on a pre-contract in January 2013 for three seasons, and last summer signed for Espnayol. Even at the age of 33, he is still going strong. Watch out for part 3 tomorrow, which is on Raúl Baena.